A well-made, entertaining, low-budget, independently produced comedy is about as rare as a Republican politician being faithful to his wife. Yet, Needtovent has discovered several over the past few years -- the Rohalian world of folksy fun and fastidious fantasy comprising THE GUATEMALAN HANDSHAKE, the gangly Gerber goober mockumentary THE BABY FOOD DUDE, and 3 DAYS BLIND, the rollicking, frolicking ribald romp from Those Keith Brothers. Joining this tantalizing trifecta is the mojo mjolnir madness brought to the screen by another pair of brothers, Jerry and Mike Thompson, whose THOR AT THE BUSTOP features more eccentric, eclectic, endearing characters than an entire season of "The Gong Show." 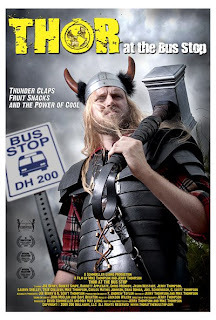 THOR AT THE BUS STOP is an impressive, idiosyncratic feature film which follows Thor on the day he will save the world. Unfortunately, this act of heroics will inevitably cost him his life. What makes matters worse, no one seems to care. Such is the maddening milieu found on "the far side" of the tracks separating Las Vegas' fabulous strip from the white-trash environs located on the edge of town. Come to think of it, THOR AT THE BUS STOP could become both Chuck Barris' and Gary Larson's favorite movie. Utilizing an unconventional approach to traditional narrative similar to that found in Richard Linklater's SLACKER (1991), THOR consists of a chain of linked, disparate characters who are all in search of something. Another example of this unique sub-genre would be THE PHANTOM OF THE LIBERTY (1974), directed by the master of surrealism, Luis Buneul. Clearly this scatterbrained structure, although quite rare, is not without precedent. Just goes to show that's there's really very little that's new under the sun -- but in this case the scorching Sin City sun shines brightly on a wonderful ensemble of unknown local talent who grace the screen with winning performances throughout. Among the seedy and needy are White Trash Chuck, a role that is perfect for Vegas native Kyle Bush. Alas, 'lil Kyle is too busy winning and whining on the NASCAR circuit, so Mike Thompson wisely cast himself in this stunning portrayal of someone desperately in search of his "inner cool." Brother Jerry's low-key portrayal of the title role of Thor hits just the right balance of pathos and platonic patriarchy. Another stand-out performance is given by Carlos Emjay as One Way Walter, the super-cool carjacker who befriends his victim even though he intends to kill him. Actually, the list of superb actors can go on and on -- there were a total of 42 speaking parts and virtually everyone delivered the goods, whether it be pizza, a bus, a yellow flower or a little bit of wisdom. "I'm gonna tell you the secret of life. You ready? There are only two ways you can act. Just two. You can be cool or not. That's it. Those are your only choices." While a ton of credit must be given to Jerry and Mike Thompson (who not only directed and appear in key roles, they also wrote the original screenplay and edited the film as well), there's no denying that the skilled producing team of David Schmoeller and May Luong surely helped guide the way. Schmoeller's name should be familiar -- he's the incredibly talented director of such classic, cult films as PUPPETMASTER (the original), TOURIST TRAP, CRAWLSPACE and the unforgettable short, PLEASE KILL MR. KINSKI. He is now an Associate Professor at the University of Nevada, Las Vegas; the Thompsons and Ms. Luong are previous students of his. I recall the old Chinese proverb, "Those who can, do. Those who can't, teach." Looks like Schmoeller is among that rare breed who can do both -- and do them exceedingly well. While all of the technical aspects of THOR AT THE BUS STOP are solid given the incredibly low budget, one must single out the Original Score by Jackson Wilcox, the Original Music Produced by Ronald Corso and the featured songs by Hungry Cloud and A Crowd of Small Adventures. A fantastic job by all -- and considerably above that found in many films costing literally a hundred times more. Oh yes, there's even an uncredited appearance by Raymond Joseph Teller, of Penn & Teller fame, just to top things off. THOR AT THE BUS STOP has recently had successful screenings at CineVegas, the Singapore International Film Festival and the 2009 World Comedy Festival in Bangkok. There will surely be more festival awards and screenings to come. In the meantime, negotiations are on-going with both domestic and foreign film distributors. It is often said that "What happens in Vegas stays in Vegas." In the case of THOR AT THE BUS STOP we hope that's not the case -- this highly entertaining and enjoyable feature film deserves a wide-spread release. More information, photos and a trailer can be found at: www.thoratthebusstop.com.